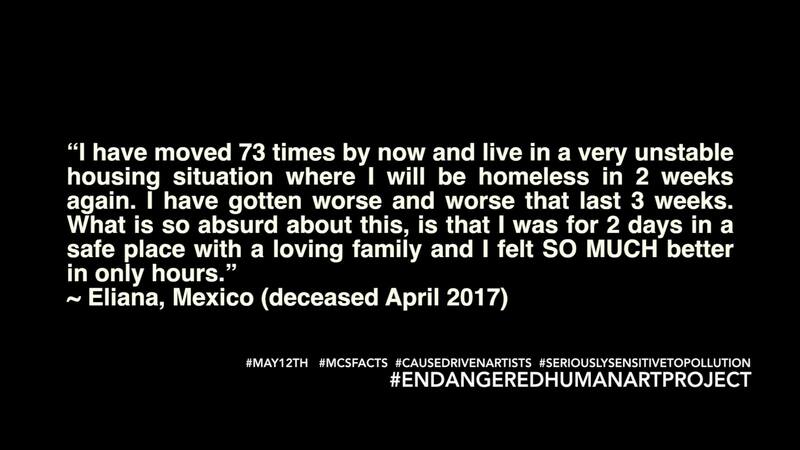 Eliana lost her life from her struggle to find a safe space to live. She had moved 73 times in the past few years, searching for a healthy place to be. The Concert Hall suggests patrons to come scent free and this ties in well with creating awareness about fresh air. 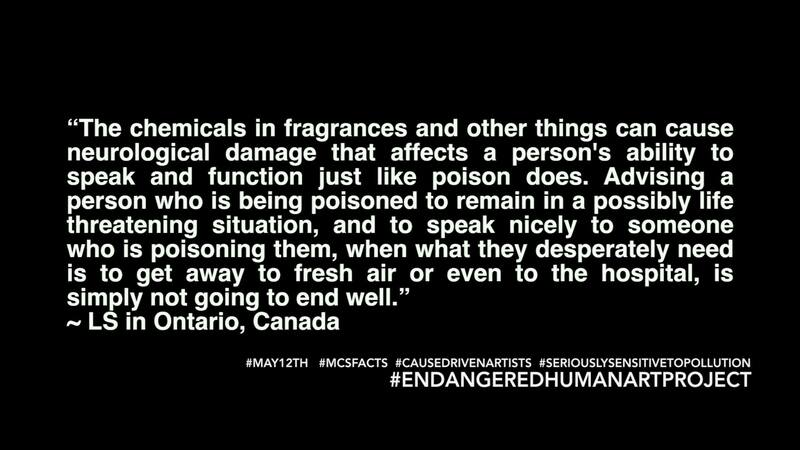 MCS is a physiological condition where people living with MCS such as myself are hypersensitive to the environment around us. It can affect all organs in the body. People suffer from pain, nausea, breathing issues, rashes, swelling, concentration issues and the regular symptoms an allergy sufferer suffers from and so much more. 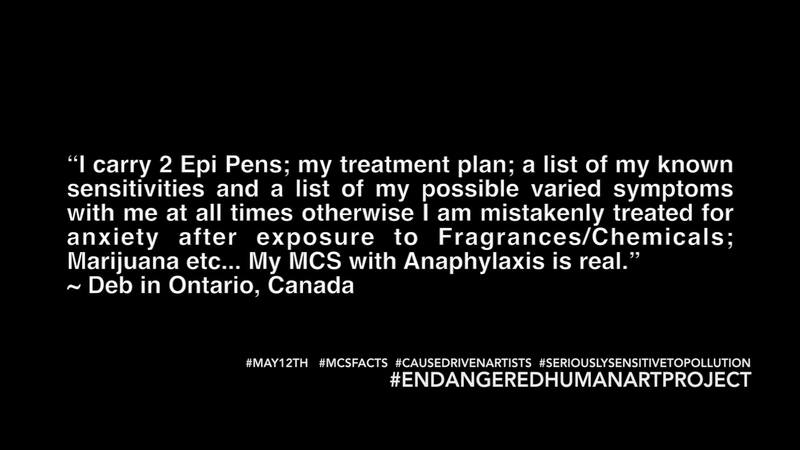 Some people with MCS can also have anaphylactic shock from such things as perfumes, among many other things in the environment. 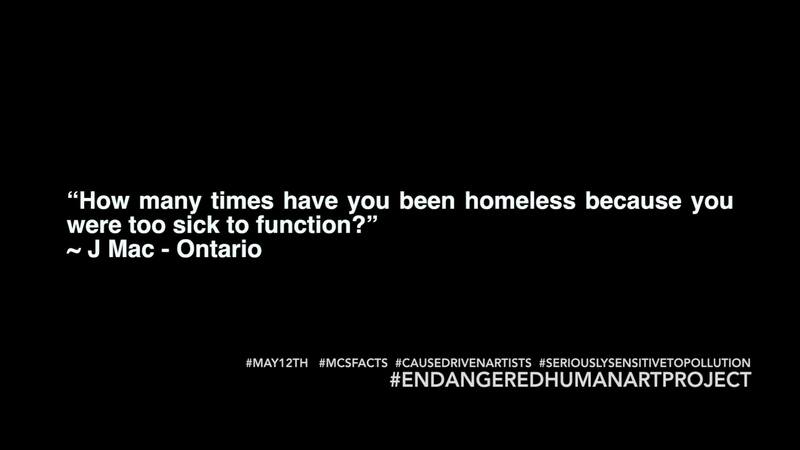 3% of Canadians have been diagnosed with MCS/EI and housing is a struggle. Many, including myself have become homeless, as living in other people’s homes and on the streets is safer than the indoor environment. I find myself searching for housing on a continual basis. When searching for a place I have a long list of questions to ask. After a few questions it is soon decided that I cannot live in the proposed environment. I have moved several times since the year 2000. In terms of fragrance, I find myself avoiding many situations. I often leave environments with breathing issues and lack of concentration. Taking a bus, going to doctor appointments or into stores, purchasing new clothes all have a regimen I have to go through. As I go out into a day I am exposed to perfumes, hair products, doctor offices. I end up leaving places, or being late for appointments and ask for special accommodation for fragrance free which is and seems cannot be controlled. I plan my day according to exposures. It affects my thinking and other organ systems as well as my breathing. Often times, I end up not getting anything done in a public space and spend a lot of time practicing AVOIDANCE. I have had to cancel doctor appointments or show up late, as I had to get off and on buses and ended up walking and either arrive late or not at all, only to find out I cannot reschedule my appointment or there is a charge. It is hard to see family members and friends and go to gatherings. Housing is the most crucial element for people with MCS and suicide is the major cause of death. 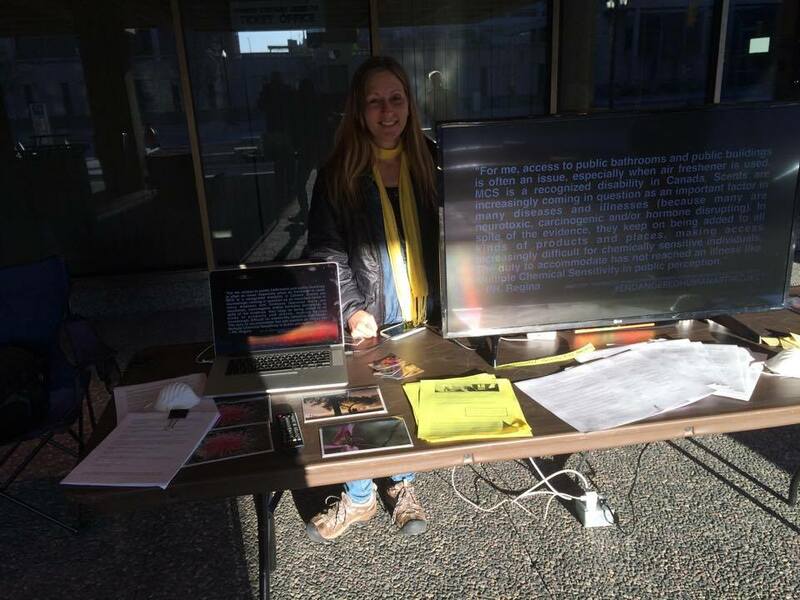 Housing has been a challenge, as there is no safe housing to live in Manitoba. For me and others in Manitoba, Canada and around the world, safe housing (space to live) is the fundamental building block to have some semblance of a normal life. The basic necessities of life such as clothing, food, water, housing, healthcare and transportation are all required and necessary to maintain some quality of life and having their needs met. Toxic mold exposure is a big problem for MCS sufferers indoors. According to the World Health Organization (WHO) very year 4.3 million deaths occur from indoor air pollution. It is almost impossible to have any semblance of a normal life If you cannot go anywhere. What we need is a community of single detached dwelling units that would be rented out, subsidized, and/or rent to own to the people suffering from environmental sensitivities. This is an accessibility issue and medical need that needs to be addressed. I feel humans are becoming endangered. Loss of habitat, transportation corridors and lack of social interaction is placing us in constant survival mode with no health care or any help at all. Thank you to all my fellow MCS friends who contributed to this project and to the Centennial Concert Hall for graciously letting me share my message. I will be sharing all the other quotes via video in the near future. Environmental sensitivities (which includes MCS) are recognized by the Canadian, Ontario, and Quebec Human Rights Commissions (among others) as a disability that must be accommodated by law, to the point of undue hardship. This entry was posted in Accessibility, Disability, Environment, Environmental Health, Health, Housing, Human Rights and tagged allergies, anaphylaxis, asthma, chemical sensitivity, chemicals in clothing, CIND, creativity, EHS, environmental illness, environmental sensitivities, Fragrance, hazardous air pollutants, homeless, Housing, invisible disabilities, Lyme Disease, MCS, MCS/ES, Mold, multiple chemical sensitivities, suicide, toxic chemicals. Bookmark the permalink. I’m sorry about your friend, Eliana. Very sobering article. It’s amazing you were able to tackle such a big project considering what you suffer with every day. I’m an artist, too, and a poet, and an MCS sufferer. I’m sharing your post.